Nina, Mika, and Kris at the 2017 Green Life Expo. The FRITA crew has been working hard to recruit enough staff members to expand hours and better serve the Athens Clarke-County community. We think we’re ready! This Saturday (February 4) Free I.T. Athens will open from 9a to 1p as a sort of test run to gauge community interest. We’ll have the store open, accept donations, and help folks out with donation-based tech support. Volunteers, we’re not prepared to host “open” volunteer hours on Saturday yet, but if you feel you have enough experience to work on your own and want to join in our Saturday fun, send me an email and I’ll pass along more details. After the presentation, CHUGALUG will hold their monthly meeting at 8:30p. So stick around for a deep dive with a bunch of lovable GNU/Linux fans. Don’t forget to check out the Free I.T. Athens YouTube page for recordings of Lachele’s n00b hours. The Free I.T. Newsletter is Back! If you’ve been to an orientation in the past year, you probably remember Jon mentioning that our email newsletter is dormant. Well, we’re bringing it back. You can sign up to receive email updates on sales, events, and general shenanigans of the Free I.T. crew. There is a sign up box in the information bar of the website, or you can click here. Come by the store to get a FREE 19″ (or smaller) monitor with the purchase of a desktop computer. Or, get $10 off a monitor 19″ or smaller. 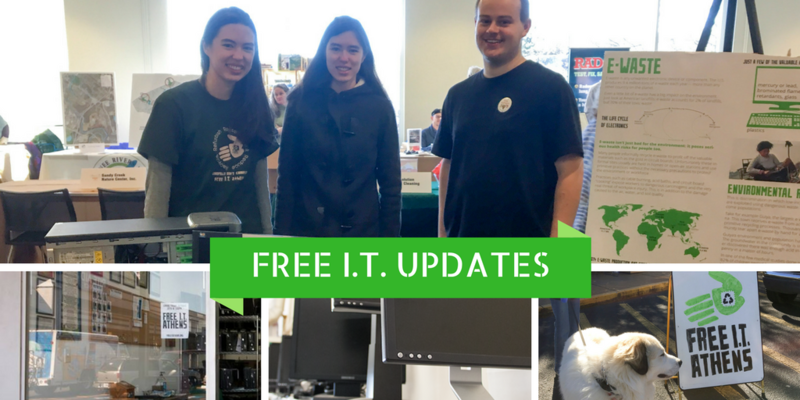 Last Saturday volunteers represented Free I.T. at the Green Life Expo, and the Saturday before we attended the first ever Athens Social Justice Symposium. Sometimes it feels like for every person Free I.T. Athens helps there are 100 more in need. For every computer we refurbish, 100 more end up polluting our environment in landfills. And for every person who starts using free software, 100 more proprietary software products ingrain deeper into society. It’s easy to get discouraged. These two events were a much needed reminder that we’re not alone. Thousands of people across Athens Clarke-County are passionately working to build a happier, healthier, more inclusive community. I find comfort in that. Staff members and I left the Green Life Expo and Social Justice Symposium encouraged, recharged, and full of new ideas on how to better bridge the digital divide, reduce the impact of e-waste, and promote the use of free software alternatives. If you missed these events, please do follow them on Facebook or sign up to receive updates so you don’t miss next year’s. You won’t regret it! That’s all I have for now! If you have any questions, comments, suggestions, or digital high-fives that you’d like to share with us, email contact@freeitathens.org. We’d love to hear from you.